Legendary designer Barbara Barry is known for her discerning eye, and modern-chic aesthetic, which is exactly what she brings to her small collection of decorative accessories. 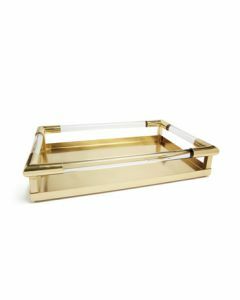 This tray is simple and still makes a strong statement with sharp modern lines and a silver border. Slots for holding the tray are on either side. A great accent for you coffee table or bar table. The tray measures 22"L X 14"W X 2.75"H. Click on image for greater detail. If you are a qualified designer, please join our trade program! If you are a qualified designer, please join our trade program!